As usual the decision was made up quite quick. 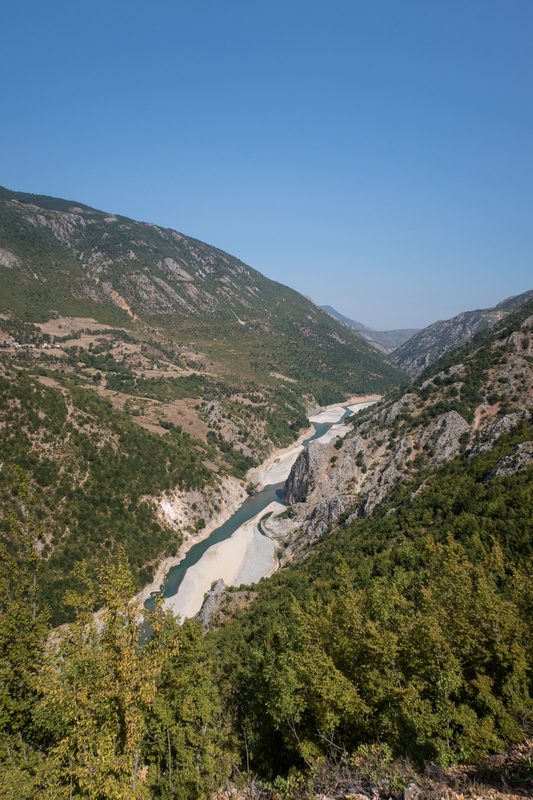 I did not knew much about Albania and have never been there, so I decided to join three friends for a roadtrip via Slowenia, Croatia, Bosnia, Montenegro to Albania, from there to Igoumentisa, Greece and the final stint home by ferry over Venetia, Italy. 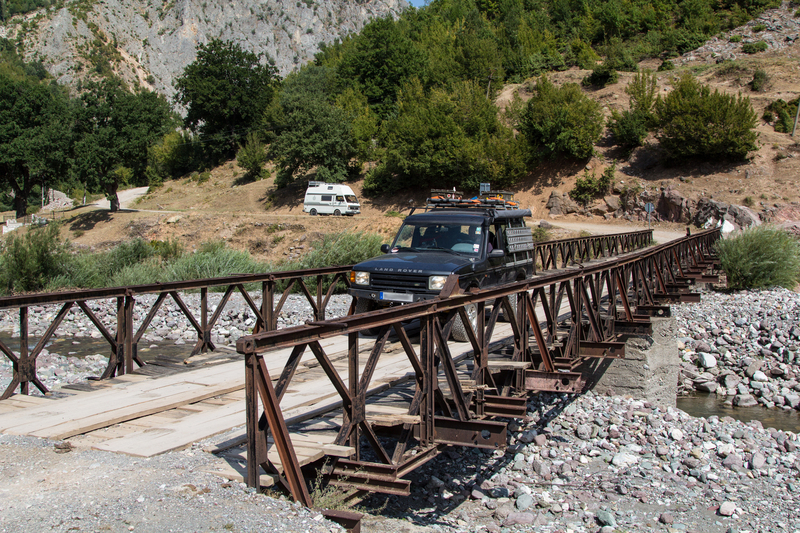 All in all we covered 9 countries – as we made a short detour around lake Ohrid to Macedonia – and covered round about 3500 Km. Arriving in Montenegro it was time to scout for a camping place. The landscape after the border looked nice, so I suggested to just leave road and look for a cozy place to sleep. My driving buddy just smirked and nodded to a sign warning of land mines in the area, so we decided accordingly to cover a little bit more distance between us and the border. The quite dried out lake near Niksic seemed a good spot to settle for the upcoming night, we found the lovely church St. Nicola where we stretched our tired bones. I can recommend the whole area behind the dam as a campground as it did seems to belong to somebody and it is not very frequented as it is used as sheep and cattle meadow. In the morning we got a visit by a sheperd, who was very friendly and did not drive us from his sheeps grazing grounds, he refused our coffee and water we offered as “rent”. He was very friend and kind and told us he once was in Germany, but got deported. 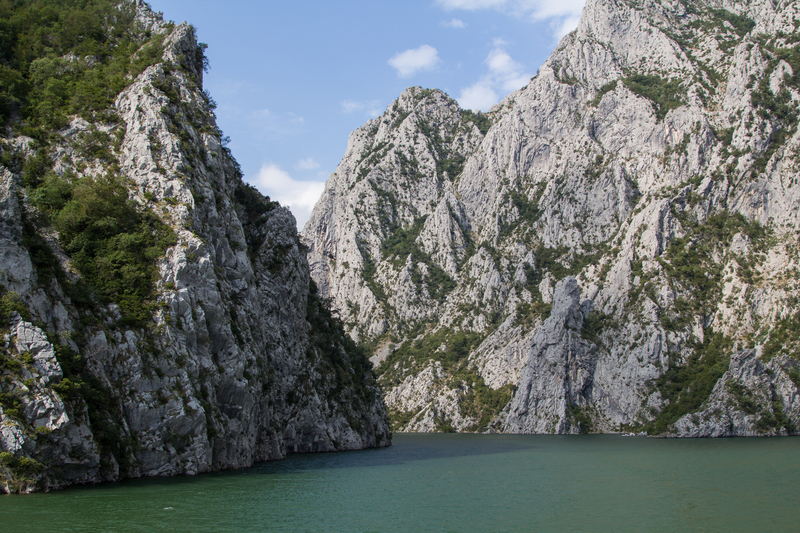 After passing the capital Podgorica it was our turn to get “plundered”! A cop waved us to stop at the right, we tried to show him our ids and the car papers, but he was wasn’t interested at all. He was talking to us in Montegrin, which we did not understand, but he was pointing to the levers on the left side of the steering wheel of the Landrover and made a twisting gesture with his hand. My friend got it and turned on the lights – the cop smiled. Then he showed up one finger and with the other hand he formed a circle and said “Euro”. We passed a 10 Euro bill through the window, which straight disappeared in his pocket and he waved us on. For a short second I thought about asking for a receipt, but quickly omitted that again. Note: In many countries like Austria, Croatia, Bosnia, Montenegro and Albania it is mandatory to drive with lights turned on during the day. Most fines for driving with lights turned off are more than 40 Euro, so this was quite a bargain for the cop and us. And besides that, it is a funny story. At the northern wing of the Skadarsko or Skutari lake, as the Albanians call it, we crossed the Albanian border, the immigration went smooth, no searching, no special fees, we just required our passports, car paper and the green insurance card. 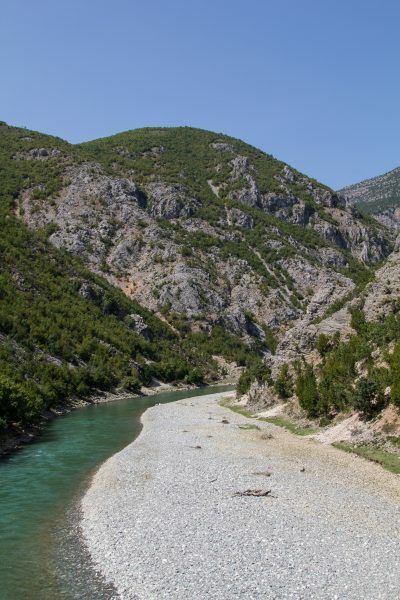 Via Shkoder the trip went on to Koman, were the first part of our journey would end and the ferry to Fierza started. Event though I just made not that much kilometers on Albanian roads, some lessons were learned: the Albanians like clean cars (you’ll get it, once you’re there), they favour German cars, especially the ones with the star on the bonnet, and the quality of Albanian road may vary – suddenly. The road through the hills to the lake Komani dam in our guide (three years old) was described as properly paved, good maintained road. Well. It was not. Or at least not everywhere, as you can see the curvy road runs up the steep mountains, in winter there is heavy snow. So the road may have suffered in three years, but to it seems that some part always have been a gravel and dirt track. To us it didn’t matter as for the Land Rover Discovery this wasn’t even foreplay, but for the caravans, it was quite a challenge. I overheard a husband gnarling to his wife: “Your damn Koman lake be better worth the pain of pushing the caravan up here!” His lady didn’t bother to answer that, except with a little smirk. According to that smirk and the fact that the Koman lake was a absolutely beautiful spot, I did not want to be that guy, when she had her payback. Right below the Koman dam along the Drin river we ended our first day in Albania in the “Natura” Camping site. When you picked up the ticket for the Rozafa ferry from the guy along the road to Koman, you can pay it at the owner of the camping site, he will write the price you paid on the ticket and you are good. Early next day, we made it up the dam to the ferry station. one should be early, as it is first come first serve, so if you have a large caravan, be there on time. The guys on the ferry know what they are doing, they were directing the cars on the deck within centimeters, if a owner lost its nerves, they steered them selves. 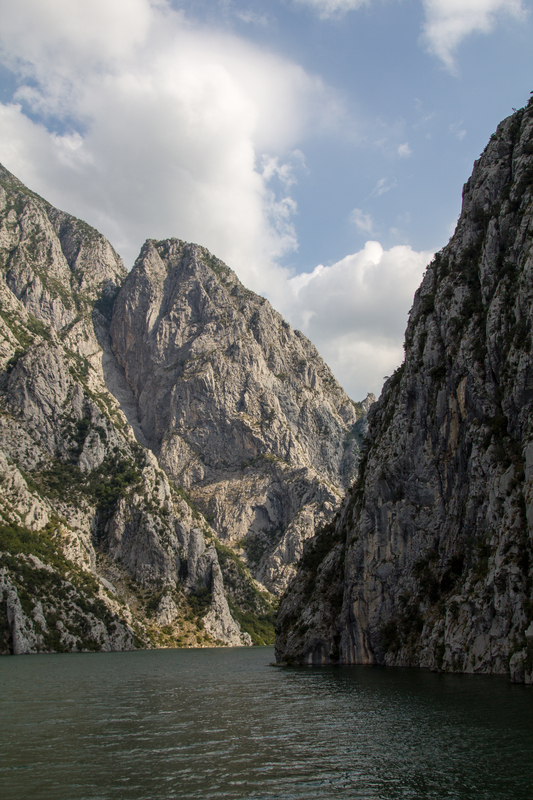 The Fjord like passages of the ferry trip were impressive and beautiful at the same time. 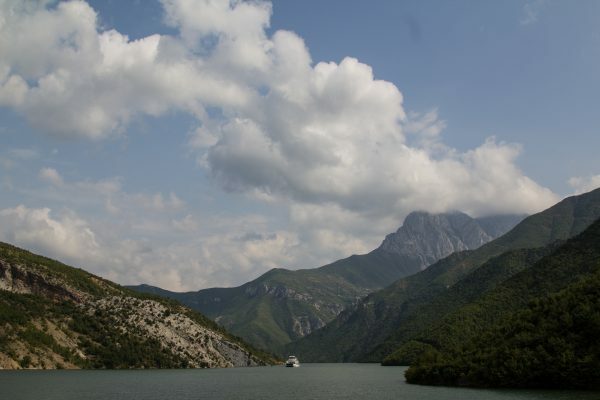 The ferry ride over the lake Koman should really be on your list when you visit Albania, as you pass a wild stunning landscape and probably will meet interesting people, locals and travellers. Narrow passes will change with smooth slopes, in the background one can admire the high mountains of the Nature Park Nikaj-Mertur. Hiking there must be a great thing to do as I heard from friend and saw of their images, unfortunately we could not integrate that into your trip, but its marked for the next time! 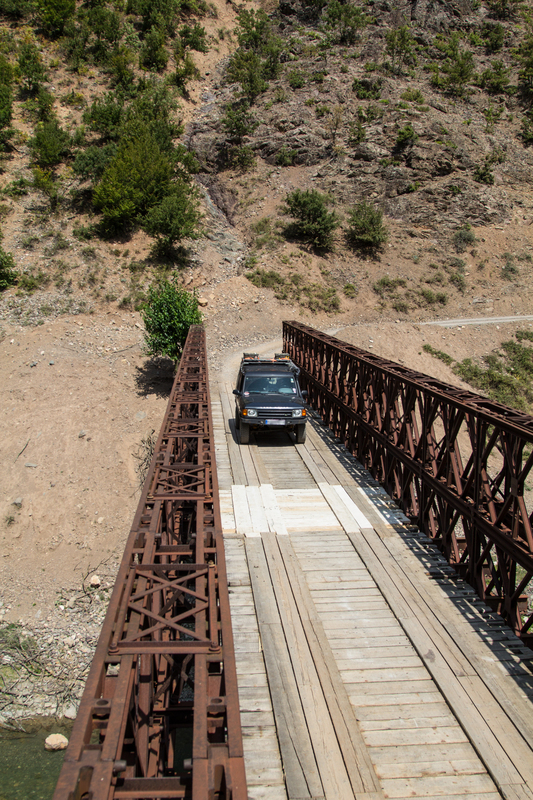 After dis embarking in Fierza we took the road rising high above another dam holding the Drin through the mountains towards Kukes. The region between Fieza and Kukes is beautiful with its deep forests in the mountains and steppe like vegetation when you approach Kukes. 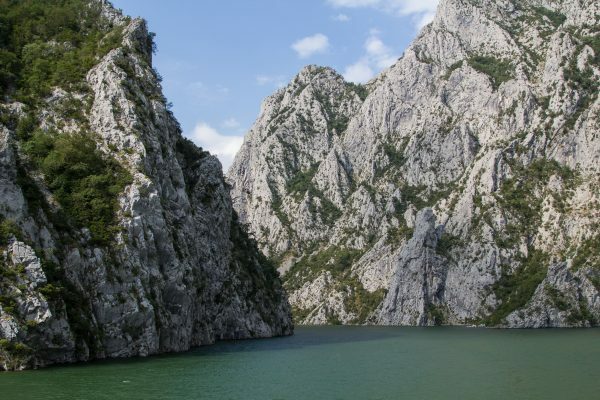 Near Kukes one can find a weird attraction of Albania, the Sultan bin Zayed Airport, which has been financed by the UAE Sheik Zayed Bin Sultan AL Nahyan. The airport had been supported for bring relief for the refugee crisis during the Kosovo War as the border wasn’t far. Nowadays it is rarely in use, so we snooped around it, trying to find a spot for camping, but failed. We headed in the direction to Peshkopi as a track along the black Drin would start there. At sunset we agreed on a campsite, which luckily was the beginning of that track, what we noticed the next morning. 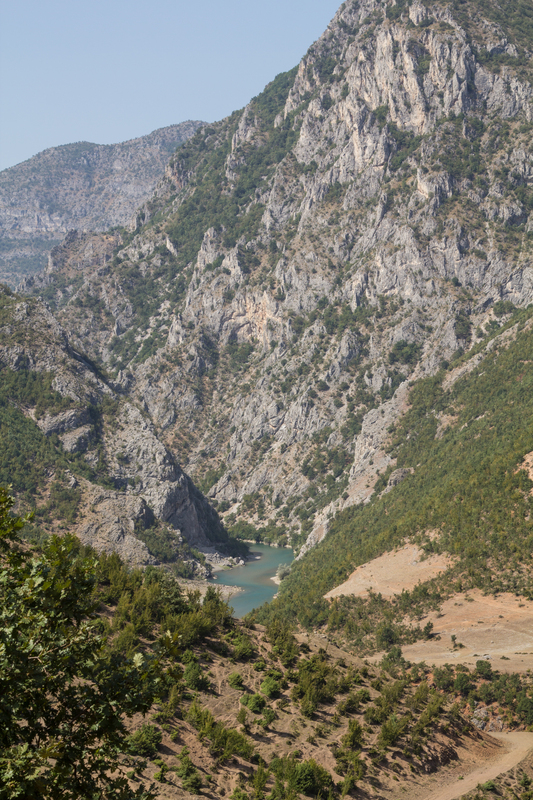 The track itself was amazing, the road was pressed against steep hills above the Drin river valley, zig-zagging through a lovely rock, but very green landscape. Even the valley was very remote the former paranoia driven Dictator Enver Hoxha had had those mushroom shaped 2 man bunkers installed here. Sometimes they were hard to spot, as they were properly placed or already in a progressed state of decay. Luckily mostly they did not mess up the pittoreske sights the country side had to offer! 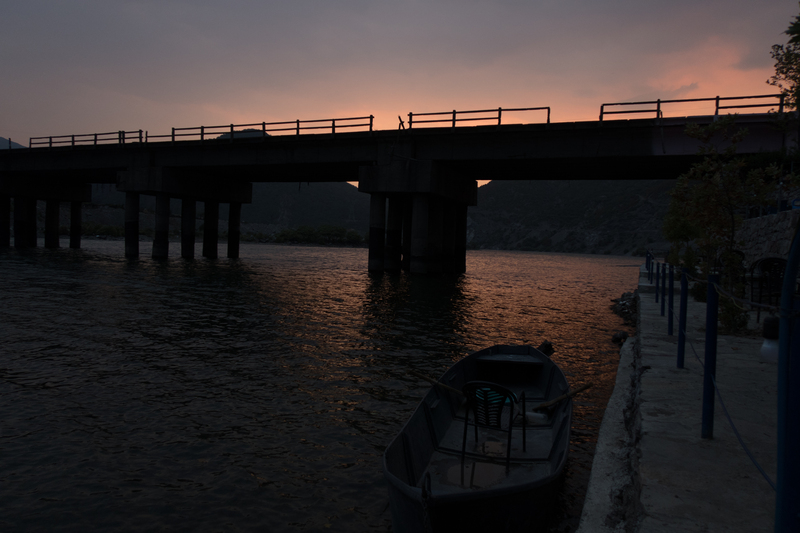 From time to time we had to cross a side arm of the Drin where old, rusty communist standard brigdes led us over the water. What the hell is corrosion protection? At the end of the day we found a lovely meadow for camping, where the sheep and the sheperd did not drive us off and had brilliant sunset and a great night under the stars. 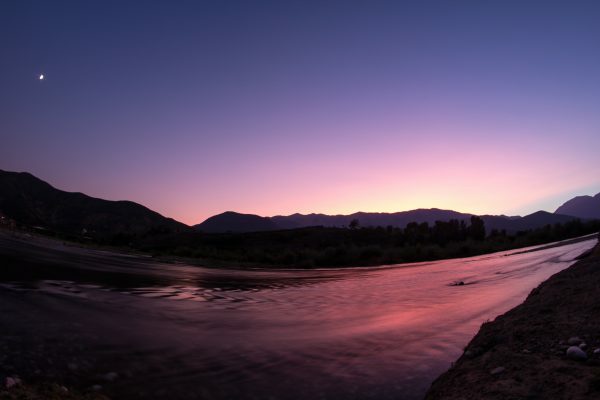 The black Drin was reflecting the the dying sunlight and gifted us with this stunning colour play.